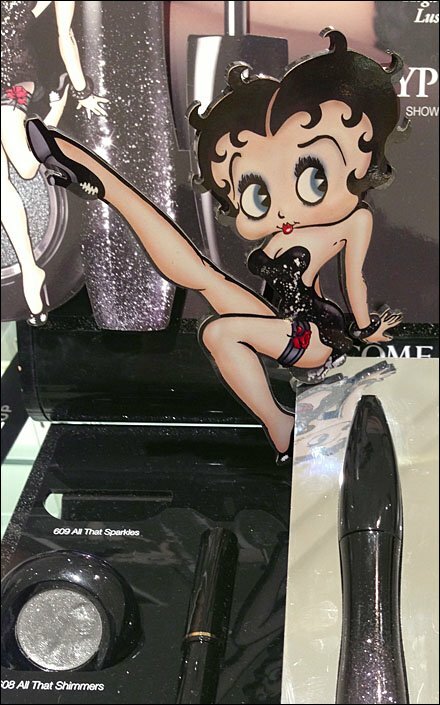 Having missed the age of Flappers I am nevertheless always fascinated by Betty Boop and her eternal ageless ability to merchandise. One might imagine she appeals to men, but here represents Lancôme® women’s cosmetics in point-of-purchase display. My fixture interest is that she is silhouetted, die-cut and freestanding in the foreground for extra visibility. Sorry the 3D effect is flattened by the 2D camera image. Step through the various focuses and angles below for a better feel of the situation.